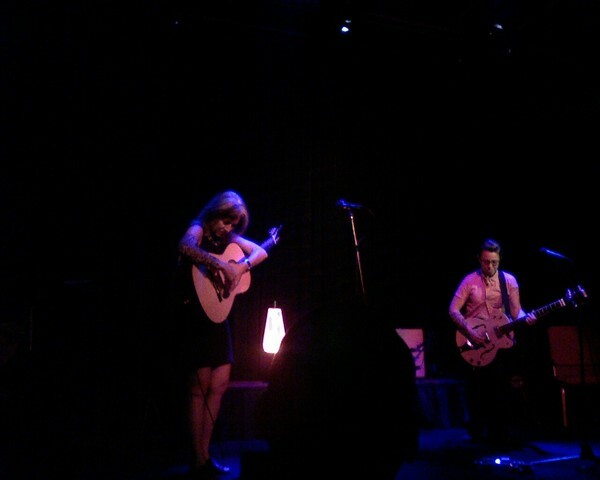 I just had the privilege of seeing a small-room show by Erin McKeown and Janet Feder in Boulder at Immersive Studios. I'm a big fan of Erin. I hadn't heard Janet before but from what I can gather she's sort of a classical guitarist gone rogue and she's great if you are into interesting noisy and dissonant but songful acoustic guitar instrumentals. Erin blends a good mix of early jazz, blues, folk, and rock with a solid voice and great songwriting chops. Her guitar sound is a really rich and slightly brash hollow body electric. I am mostly familiar with a live record of her's called Lafayette, and on that record her guitar sound on "Blackbirds" is my absolute all time favorite. So Janet played mostly instrumental on a "prepared" acoustic guitar. "Prepared" is the term used in conservatories for when pianists put stuff onto the strings and otherwise futz with it under the hood. Janet had some really cool effects with hooking small metal bands onto the strings as well as tying a loose guitar string around one of the strung strings and then dragging the loose string along the regular string. She played in a bunch of unusual tunings and her songs had lots of nice crunchy harmonies while still being tuneful and sonically very interesting. It was also cool to watch how relaxed her left hand was and how lightly she pressed the strings to the frets. Definitely an unexpected pleasure especially since I'm primarily listening to melodic pop bands these days. It reminded me of my days at Oberlin. The space is a small 60-seat theater in a recording studio, so it was very intimate and the sound was terrific. This reminded me of when I got to hear Charlie Hunter upstairs at Mo Pitkins in NYC. The audience was quiet and attentive with the one exception of one very young girl who was there at the beginning for a few songs before her parents' delusions about this being an appropriate place for a five-year-old finally wore off and they carried her out. In other news I went code complete on a major release as well as a subsequent patch release this week so there's a good ten months of work or so that is done and done. Now it's on to the next big project full steam ahead as always. Got some fun plans for the weekend as well. I was glad to be back to climbing and exercising this week as well after lounging around eating Oreos on vacation last week. Chris Wall turned it up on notch on his Group Fitness 2 class on Tuesday and made us do 12 sets of each exercise instead of the usual 9. I'm still a bit sore in the thighs and shoulders from that. I also did some lead climbing on Wednesday and tried out my new rope. Just need to wait for my backordered carabiners and I'll be fully equiped for outdoor sport climbing.